Oh, and it will be developed by Sonic Team. How is that for a shocker? Sega: One of the first things that we did after acquiring Nintendo was to take a look at Smash Brothers, because we felt that it hadn’t really been living up to its full potential, and that a change was needed. The world of Sonic is not only a vast and rich would, but also incredibly popular with the fans, and one of the most relevant franchises left in the gaming industry, so it was an obvious choice. Sonic was already in Brawl of course, so we had to think beyond our favorite hedgehog. At first we asked the developers at Nintendo to merely replace a small handful of Smash Brothers characters with Sonic staples like Tails, Knuckles and Dr. Eggman, but it quickly became evident that this would not be enough. 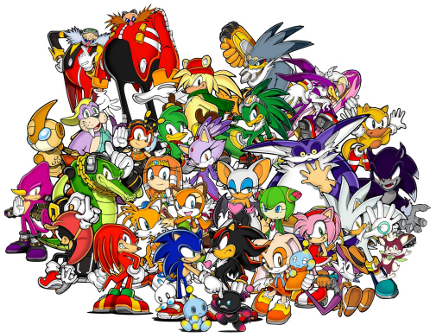 What about Sonic fan favorites like Cream the Rabbit, Princess Elise, Big the Cat, Shahra the Genie, Charmy Bee or Heavy and Bomb? Were we really going to leave them out for some nobodies like Donkey Kong, Pikachu, and Samus Aran? Who is this Samus Aran guy anyway, has anyone even heard of him? So we made the logical decision and decided to base the game completely around Sonic the Hedgehog characters. However, the team at Nintendo resisted this change, so we had to axe them from the game [editor’s note: I can confirm that all Nintendo employees previously working on Smash Brothers have been fired] and put Sonic Team in charge. I think we can all agree that this was the best decision to make. What do you think? It’s tough to argue with his logic. I have been informed that the full line-up will be revealed at this upcoming E3. I just hope that Shadow the Hedgehog is in the game! No playable Metal Sonic = no buy. Finally, some good characters to choose from. Kirby and the Ice Climbers ruined the first games for me. If it's anything like Sonic & All-Stars Racing Transformed it'll be better than Smash Bros.! I heard a lot of people saying that was better than MK Wii. I don't know how true it is.